Imagine stumbling across a smoky back street bar, late night jam: Django Reinhardt and The Pogues; Robert Johnson accompanies Edith Piaf; Bob Marley’s jammin’ with Stéphane Grappelli; Tom Waits joins in. This is French Connection. At the ensemble’s heart are the undisputed talents of multi-instrumentalist, erstwhile Godfather of grunge folk, Wild Willy Barrett. Featuring an original melange of French, Irish and English acoustic arrangements, using everything from a guitar and cello, to Irish pipes and banjo, there really is nothing else quite like them. For John, a master of the Uilleann pipes, this has been an interesting couple of years, having also played at Buckingham Palace in the presence of the Queen. The group was born during a chance encounter in 2002, when Willy approached a cellist he saw performing with a belly-dancing troupe. 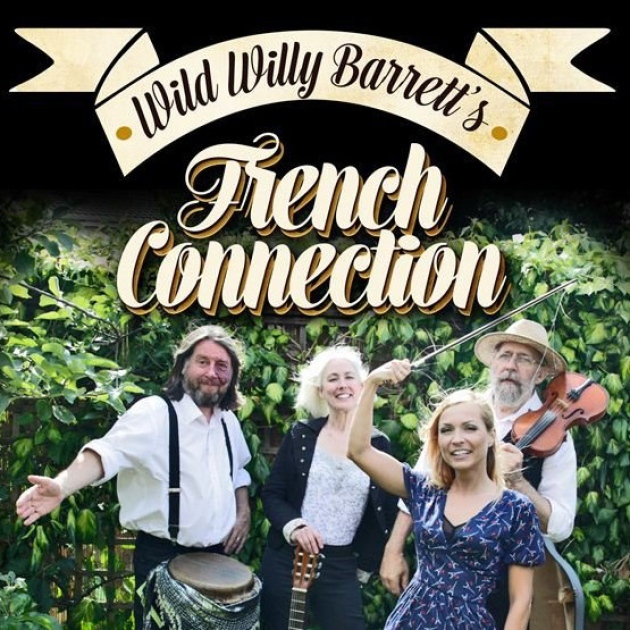 The Willy that Mary refers to is Wild Willy Barrett, known as the Godfather of Grunge Folk, a highly respected musician whose styles include folk, blues, gypsy jazz, reggae, bluegrass and punk. Having recorded Rasta Communication with Sly and Robbie, toured with U2, Police, Madness and many more, been guitarist for George Hamilton IV, considered for Brian Jones’ replacement in the Rolling Stones, recorded ‘The Contemporary Folk Guitar’ album with Bert Jansch, John Renbourn, Gordon Giltrap & Ralph McTell, Willy has had a long and varied career. But it is the gentler side of Wild that emerges with French Connection. Originally from Nancy in France, Aurora’s lively personality fits in perfectly with the quirkiness of the other musicians, and she is already wowing audiences both French and English alike with her beautiful vocals.